A traditional Artist gone Digital, Riel spent a big part of his high school years drawing, painting, and making skateboard videos with his friends. These combined passions eventually led him to the Vancouver Film School where he graduated with a diploma in Digital Design in 2010. 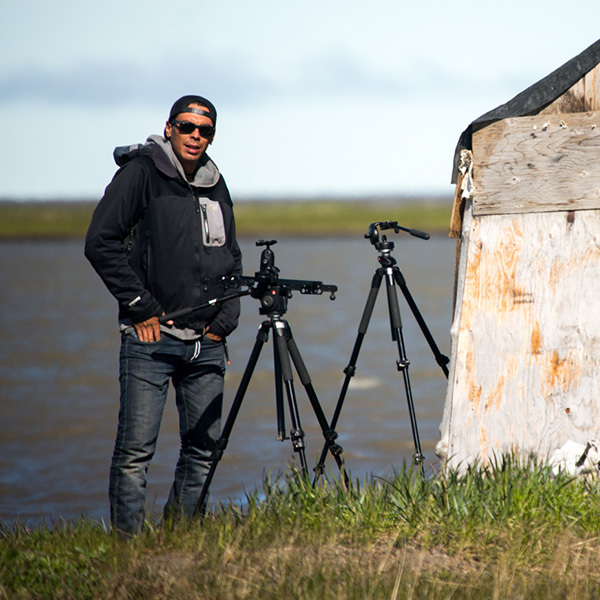 When not working for Dene A Journey, Riel is skateboarding, volunteering for Western Arctic Moving Pictures (WAMP), and practicing/investing his time in Adobe After Effects/C4D for future projects. We were in Jean Marie for Kristin’s episode, sitting around the fire with Bill and Steve & Amos , Amos asks me “Hey Riel, Metis?” and it had been a long day, I was slightly cranky from the heat and responded “no man, I’m Cree-Chip” we went back and forth a few times and each time I was a little more annoyed and I just said the same thing “no, not Metis, Cree-Chip!” and Amos finally clarified & slowly said “No Riel, I asked if you MADE TEA”. Whoops. Filming on the Keele River and in the mountains around Tulita.